Welcome to the Lily Pad Cards’ First Birthday Blog Hop! If you are following the hop, you should have arrived from Sally's blog! Happy Birthday to one of the most inspirational sites out there. They are sure celebrating in style too, as there are three awesome prize packages (awarded by random draw). The blog hop lasts for a week, so you have until 12:00 pm EST on Sunday, April 8th to leave comments. Here are some details about the hop: There are two ways to be eligible for the prize drawings. You can “like” Lily Pads on Facebook, and leave comments on the blogs participating in the hop. Here are some details about my card: I started with a white card stock base and stamped the hexagons from The Craft's Meow Thanks Bee to Thee set in Tuxedo Black Memento Ink. I then printed, colored and fussy cut the flower digital image now available at The Craft's Meow Store. After adhering the image to the card base, I wrapped it all with twine and added a sentiment from SRM Press. I also have another card up at The Craft's Meow Blog, the last stop on the hop! Thanks for stopping by! The next stop on the hop is Ayana! I love the gorgeous hexagon pattern Karen. Such a cheery card! Nice simple card! Is beautiful! love the simple hexagon behind the wonderfully colored flowers! Beautiful CAS design. Love your card, Karen! Very pretty - I love the flowers and the hexagon design creates a nice contrast. HI Karen, thanks for dropping by and have a thought to peep. Your comments and thoughts about my work are truly grateful for me. I do hear and visit about your blog and love your simplicity style. You are a great and dedicated designer. So inspired with your blog everyday! I'm lovin' all the hexagon patterns out there lately! Looks great with pretty flower! Great card! Your first card is so pretty! I love your colouring and the striking colour combination! Your mustache card is such a fun card! Karen I love your style! both your cards are so pretty! 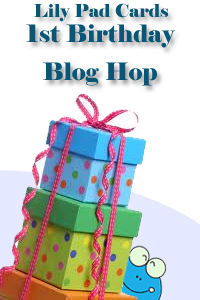 Thank you for celebrating with us and being a stop on the blog hop! Une magnifique carte pleine de délicatesse ! Love the simplicity of design on these cards. So elegant. I love your first card. Thanks for the chance to win! STUNNING CARD card, Karen!! You totally rock this blog hop! Stunning cards! (Also LOVE the tightrope walker in your previous post!) Great to celebrate with you on the hop! Love what you created Karen. Both are fab. beautiful card! i love the graphic hexagons and the pretty pink flower! Hi Karen - what a fabulous card. I love everything about it. I want those flowers. Simply lovely!! Two terrific cards! I love the design of the "Thanks a Bunch" card. Great white space...makes me happy! what a great and simple card! So pretty! I love the hexagons for the background. Simple elegant + Fun birthday card, great combo. Hi Karen! Your work is just SO cute. 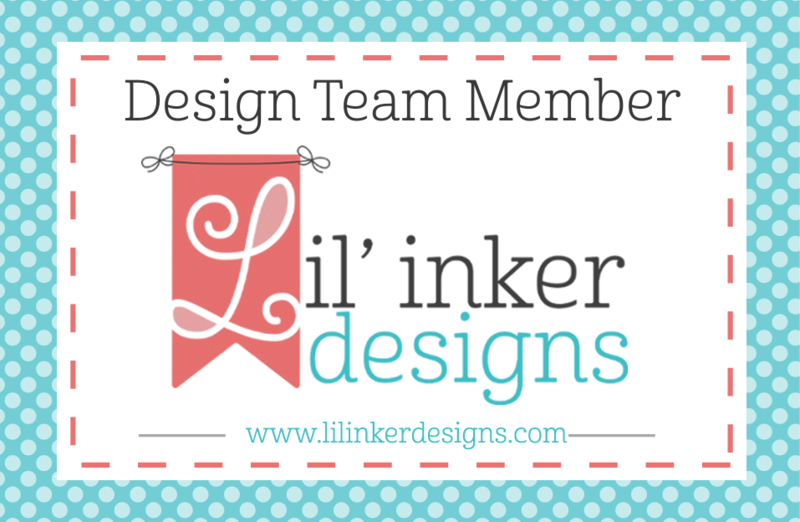 Thanks for sharing it, and for being part of the celebation at Lily Pad Cards Blog. Your work is a blessing! Is this your digi image? Love it with the hexagons. Beautiful floral card! LOVE the "pop" of pink!! Great cards! I don't know if I've mentioned it already, but I just love that grateful flower digi, great lines, and great potential for piecing and layering! Such an elegant card...and I love your color palette!!! Gorgeous! Love the flowers and the honeycomb! The mustache is too funny! That hexagon stamp is awesome and I love how your flower looks in pink and green! LOVE the hexagon pattern and the placement of the twine! And that mustache card is SUPER FANTABULOUS!!! The font of the word "mustache" is AWESOME and I dig the punny sentiment! Very nice card, love the design. These cards are too much fun!!! Beautiful! Very striking card with black/white/pink combo! Wonderful cards. Great combos. You are a busy lady! Both cards are great. I like the simplicity of the flower card, it really draws your eye to the focal point. The flower is so stunning! I absolutely adore the contrast with the hexagons, baker's twine, and the colorful blooms. Gorgeous card, Karen! Your other card made me giggle. I love the row of mustaches! Great cards...esp love the hexagon pattern. Nice CAS card and I too love the graphic work of the hexagons. I love how the colored flowers 'pop'. Just gorgeous! Lovely cards... Thanks for sharing. Awesome cards! Love that bg & perfectly coloured flowers and who can resist the tache! Just FAB! Beautiful card, Karen! Love the hexagon BG and your coloring of the flower is awesome! Off to check out your mustache card at CM! Teehee that mustache card made me giggle! Fantastic CAS card, and awesome coloring. Fun card, I love the CAS design and your flowers are so pretty!! Love the cards! The flower card is beautiful! These cards are so great. Love the use of white on the first...and the coloring! Wow. The second one is such fun. Love those hexagons and the flower is so nice. The "Thanks" card so pretty! 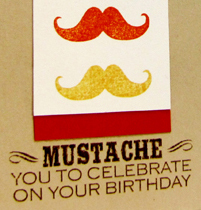 And the "Mustache" card so fun, great combo for the celebration. beautiful card karen...I love how you colored the flowers...so pretty.. Very pretty! I love CAS cards that allow the image to pop out! Karen, your card is lovely! absolutely lovely - beautiful colors and design! so pretty! love the honeycomb background. simply fabulous, Karen! This is beautiful! I love the background being in black and white, it makes the color of the flowers really stand out! 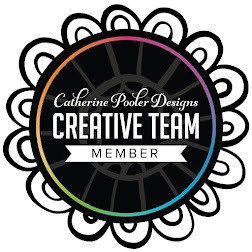 Very CAS card - love the pattern and the pop of the flower! Wow. Just stunning! Really looks like the twine is holding those flowers!! Your floral card is so perfect! That honeycomb bg is just right for the flower! And the moustache card is delightful! Hexagons sure are popular these days. Nice job! Thanks for sharing! Great Card!! Love your card, Karen! Beautifully designed. And thank you for helping me with my blog!! What a great use for those neat stamps! LOVE both of your cards. Wonderfull card! I love the "simplicity"and the collors you've used! Those flowers look like I can just reach out and grab them! Great Job! Such a pretty card! Beautiful flowers =) TFS! Very pretty. Simple and clean looking. 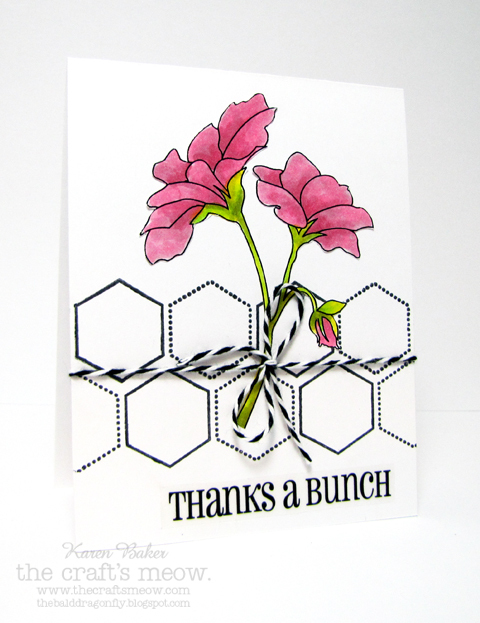 Lovely flower card--love the hexagons and very funny mustache card. These designs are really fantastic! I LOVE all of them, and I'll be following your blog too! Awesome cards! They are both great! You made some very fun cards! Love your humorous cards...well done! AWESOME card - love the pop of color with the B & W!! What a beautiful, inspiring card! I love your unique style. What a wonderful card. I just love the hexagon shapes with the flower. Very beautiful. Love the hexagons and the coloured flower! Wonderful cards. The first is so pretty and the second is so fun! Great cards! Really love the masculine one! What a pretty card. The mustache one is a riot. Love it - so light, colourful and chic! I love the floral card (classic colours, and the hip twine & honeycomb? Love!) and I can't wait to see the rest of that moustache card!! Happy Birthday Lily Pad Cards! Stunning cards! Love the bright pink color flowers! Beautiful card and the last one is so fun with it's mustaches. Wow you have one happening blog here. You must be so busy. Good on ya. Beautiful card - as always. I love that you made a thank you. Lily Pad is really a great place for inspiration isn't it? Love the hexagons, cute card. Cute cards. I really like the hexagons with the twine on the first. both cards are beautiful but I love the pop of color on the first card. Thanks for sharing. These cards have such a clean and simple style -- great job. I love the clean and simple look of this. I have so many digi stamps that I could use with this. Brava! Just lovely!